Michael Jordan had been rehearsing for hours. Not from a script. He would speak off the cuff, using note cards, as he always does -- he has a photographic memory. He just wanted to make sure he hit all the salient points. The coming Tuesday was his Big Day. He had been Westinghouse chairman nearly seven months, and the investment community wanted to know what this member of the "Class of '93" -- outsiders brought in that year to turn around IBM, Eastman Kodak, Scott Paper and Westinghouse -- had up his sleeve. Jordan and Fred Hill, his communications manager, finally broke for some Chinese food. On the way back up the elevator at headquarters, Jordan cracked open his fortune cookie, read it, chuckled and handed it to Hill. It said: "Your skill will accomplish what the force of many cannot." It was Sunday night, Jan. 9, 1994, 36 hours before he would unveil to New York analysts his prescription for repairing ailing Westinghouse -- and 47 months before Westinghouse would become a memory. The presentation went well, though Jordan hardly wowed them. His remedies weren't flashy stuff. "This is not a classic restructuring a la Allied Signal," he told the analysts. "This is not a case of coming in, taking 25 percent out of the corporate staff, selling a couple of businesses, shooting a couple of general managers in the courtyard and then using your balance sheet to go forward and acquire." Rather, Jordan said, he would take a go-slow approach. Analysts were underwhelmed but comfortable with that. They knew the problems that plagued Westinghouse had been years in the making and would take years to fix. There were a $750 million pretax charge to cover write-downs of divested businesses and work-force reductions totaling 6,000 over two years. But layoffs were hardly news at a company whose employment had shriveled to 85,000, half its decade-ago level. And divisions to be sold already had been put on the auction block by his ousted predecessor, Paul Lego; Jordan was simply carrying out the restructuring plan. The contrast with his contemporaries was striking. IBM's Lou Gerstner, Kodak's George Fisher and Scott's Al Dunlap all had come in with guns blasting, slashing jobs, vowing to ax divisions that couldn't keep up, and pledging to do things a lot differently than their predecessors. Then here was Jordan -- lanky, rumpled, with slightly tousled hair -- appearing to wince as he methodically and monotonously outlined his agenda. The core message: He had seen the future, and it wasn't all that different from the past. At least, that's what the analysts heard. What Jordan was already beginning to realize was that the old-line corporation was in worse shape than he thought. He knew about the financial unit's difficulties, everybody did, and the drag it would create as Westinghouse dug itself out of that hole. But he was caught off guard by the amount of underfunding in the pension plan, as well as by costs linked to environmental cleanup disputes and nuclear equipment lawsuits. Combined, those liabilities exceeded more than $2 billion. Once he studied the balance sheets, he also discovered that over the years they'd been loaded with one-time events to prop up earnings. There were no world-beating businesses. Jordan knew that. But the performance of most units was worse than he had expected. Every chairman has to deal with "legacies" -- inherited surprises and problems. Jordan understood that. Robert Kirby had uranium; John Marous, a company with a portfolio of slow-growth businesses, save a fatally flawed fast-grower; and Lego, the collapse of that fast grower, financial services. What really bothered Jordan was the insular culture he found embedded in the corporation. There was little exchanging of ideas among upper managers, the sort of water cooler bull sessions about strategy, new businesses or new ways of doing things. This is what had become familiar to him during his years as a consultant and PepsiCo executive. But these guys at Westinghouse were engineers, not entrepreneurs. Westinghouse was still a bureaucracy, a throwback to when it was so scattered and diverse it needed organizational controls to contain the chaos. It was as if all the managers worked in boxes -- this was their area of responsibility -- and didn't venture out. Communication was by memo. "It was stay put and shut up," Jordan says. "Don't make waves." In a way, Westinghouse mirrored the city it called home. Pittsburghers are an insular, stick-to-the-rules lot. They don't move and tend to live in the same neighborhoods where they grew up. And they live in a region where clearly defined work rules are one of the hallmarks of its strong union influence. It was only right that a corporation that had been around more than a century would take on some of the attributes of its hometown. There was one more trait Jordan would have to fix: Westinghouse thought like a government agency. That's not so surprising. About a third of its business fed off government contracts. But the result was that when it did things, it tended to do them in a big way, with big consequences and little thought to expense. For example, Westinghouse plunged into the waste-to-energy business, spending hundreds of millions snapping up companies, improving the technology and becoming a leader in the new field. But aggressive community recycling programs and concerns about the toxicity of incinerated waste shrank the market almost as fast as Westinghouse expanded to serve it. Using its satellite-to-ground expertise, technicians at its defense electronics unit in Baltimore developed cellular phones for the commercial market. But instead of inching into the market, they plunged full bore, committing to three years of inventory. The problem was, Motorola and other big players already had developed strong distribution channels. The bottom line? The division was stuck with 60,000 handsets and no customers. "There was no real concern about costs," says a corporate relations vice president who joined Westinghouse in 1995. He was astounded to find people in his department routinely receiving annual raises of 7 percent, 8 percent and up even as the company was struggling and its stock was stuck in the mud. "It was just expected," he says. If Jordan was discouraged by what he found, many Westinghouse employees were less than enthusiastic about him. He may have been a naval nuclear engineer, a stint that brought him to the Bettis Atomic Energy facility in West Mifflin in the early '60s, but Jordan sure didn't act like one. That may not have been fair -- Jordan could just as easily talk about the mechanics and advantages of pressurized steam reactors as he could about the reasons for subtle differences in Pepsi's sugar content in Europe and the United States. But from the insiders' perspective, Jordan lacked the credentials. Unlike past chairmen, who'd come up through the ranks and were familiar with the intricacies of Westinghouse operations and technology, Jordan was an outsider, a marketer, a "strategist." He'd spent 18 years at a chips and soda pop company, and 10 at McKinsey & Co., a consulting concern. Everyone knows consultants don't make anything -- they just talk and listen a lot, then draw up expensive plans from a boilerplate in the home office. Ask one what a capacitor did and you'd probably get a blank stare. And the mentality at Pepsi and Frito-Lay was, "You advertise on Super Bowl Sunday and the next day, sales go up," says a former middle manager. "It didn't work that way at Westinghouse." It also didn't help that Jordan didn't really live in Pittsburgh -- he bought an Oakland condominium but shuttled back and forth on weekends from Dallas, where his wife remained. After Westinghouse bought CBS, Jordan spent a lot of time in Manhattan. After all, it had good restaurants on every corner and a vitality Pittsburgh could never match. But what really rankled a lot of managers was Jordan's seeming lack of respect. In the 1994 annual report, Jordan talked about the energy and excitement when a ship turns at sea at full throttle and how he could "feel that dynamism" in Westinghouse. But when probed, he'd indicate he was disappointed in the quality of management and that he'd found the bureaucratic mindset entrenched. In a way, Jordan was his own worst enemy. His clumsy attempts at expressing dissatisfaction with the way things worked at Westinghouse came across as if he felt he were working with a bunch of incompetents. But he actually liked most incumbent managers and didn't make wholesale personnel changes when he first arrived. He brought only a few PepsiCo executives with him, the most notable being Fred Reynolds, his chief financial officer. Reynolds was more a flashy investment banker than a flinty-eyed accountant. He relished making deals. He did $26 billion of divestitures and acquisitions in three years at Westinghouse, including the sale of eight major divisions for almost $10 billion, all at prices, he liked to remind anyone who'd listen, well above Wall Street estimates. Then there were the consultants, wave after wave of consultants. Though they'd been around before, they started arriving in droves at headquarters about the same time Jordan did, first from McKinsey, then from Andersen Consulting, and later from McKinsey again. Whole days would be consumed by fresh-faced MBAs who'd tag along to observe people twice their age at work. And they were everywhere, seeking, in consultant-speak, ways to "rationalize the central organization" and make it "more efficient and creative." Translation: They wanted to find where to cut the bodies. One of the studies that began in 1995 was officially called Genesis, but most insiders knew it by another name, Genocide. It was hoped the effort would reinvigorate headquarters. Instead, it bred paranoia and sapped morale. It's not hard to understand why. Every time a new group of consultants came in -- about six to eight months on average under Jordan -- a new way of doing things would be tried, followed by a new round of layoffs. "We had so many consultants and consultants' studies that a lot of people didn't know what they were supposed to do," said a veteran communications staffer. "It got to be where people felt their contribution wasn't appreciated. If it was, why was it constantly being analyzed?" A year into Jordan's regime, it was apparent the hoped-for revolution at Westinghouse wasn't taking place. Westinghouse was doing better. By the end of 1994, it had slashed debt, recorded a profit, stunned the power industry by beating out bigger rivals for the first joint venture power generation project in China, and linked up with CBS to co-own TV and radio stations in top markets. Despite all this, Wall Street yawned. Westinghouse stock had hardly budged since Jordan came on board. And pension funds and other shareholder organizations that had hounded Lego were starting to press Jordan too. The bottom line was the same as it'd been since Danforth pulled out of cable -- Westinghouse needed a growth engine and didn't have one. Its biggest business, defense electronics, made good money, but was confronting an uncertain life after the fall of the Soviet empire. To grow, it would have to buy. And that meant billions of dollars. Power generation, which made the big turbines that churned out the power for utilities and industry, faced mounting global competition. And pending electric industry deregulation was already shrinking the domestic market. Nuclear? The story hadn't changed there for two decades. China offered opportunity, but Westinghouse was blocked as long as Congress and the Clinton administration maintained a ban on nuclear exports. Thermo King made reams of money, but its sales were under $1 billion and its prospects for huge growth were limited. It already dominated the domestic over-the-road refrigeration market and was a major player overseas, too. Then there was broadcasting. Long overlooked despite its storied history -- Westinghouse established the nation's first commercial radio station, KDKA, in 1920 -- it seemed out of place with the rest of the company. Broadcasting accounted for about 10 percent of revenue, but generated almost a quarter of Westinghouse's operating profits. It was small, and would require huge sums to grow. But at least there were opportunities to grow. So it had come down to defense or broadcasting. If Westinghouse settled on one, the other would have to be sold. There was no way it could afford to carry both, since each could expand only through multibillion-dollar acquisitions. It wasn't clear which course to take. Then Rupert Murdoch struck. When the Australian media magnate snapped up eight CBS-affiliated stations in the summer of 1994 for his Fox network, Westinghouse quickly stepped in to provide CBS with its Group W TV stations in exchange for jointly selling advertising and seeking new TV and radio stations. The die had been cast. Bill Korn, the head of broadcasting and a holdover from the Lego years, for years had envisioned making a run at one of the networks, and here was one served up on a silver platter. The more Jordan studied the idea, the more it made sense to him. The broadcasting group -- which owned five TV stations and 18 radio stations -- already had high profit margins and a spot in many top markets. And Group W did a much better job running TV stations than did CBS. But the hidden jewel was radio, where Group W's operating margins -- the ratio of operating profits to sales -- were 42 percent, 40 percent higher than at CBS's stations. And with a combined network of 39 stations, the advertising dollars would roll in. At the same time, the additional expense would be minimal. A lot of programming can be duplicated across markets, such as sports-talk shows and all-news formats. So the more stations it added, the more Westinghouse could spread its costs around and the higher its profit margins could be. A CBS buyout would be expensive -- Westinghouse's investment bankers indicated the going price for CBS would easily top $5 billion. That would mean it would have to add as much debt as it had cut the past two years, the "dig-out years" as the Jordan regime called them. But banks were more than eager to finance the deal. They saw what former CEO Kirby had seen 15 years earlier -- broadcasting was a cash cow, easily generating enough money to cover interest on the new debt. There were more lenders willing to supply the $7.5 billion credit line that Westinghouse would use to finance the $5.4 billion CBS bid than were needed, at interest rates that were even more favorable than Jordan had expected. 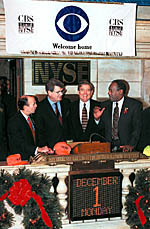 On Aug. 2, 1995, Jordan and CBS Chairman Laurence Tisch unveiled the deal amid much fanfare in New York. Back in Pittsburgh, the announcement was broadcast live to a Gateway Center lobby packed with silent employees. Several said afterward that they wouldn't be surprised if Westinghouse moved to New York in a few years. Indeed, the broadcasting juggernaut was just starting. With Congress clearing the way for multiple ownership of TV and radio stations in the same markets, Westinghouse followed the CBS acquisition with a $4.7 billion takeover of radio giant Infinity Broadcasting. The move made Infinity Chairman Mel Karmazin Westinghouse's largest shareholder. More importantly, it brought him into the fold. The gray-haired executive is an egotistical but highly effective manager with a reputation -- and record -- for squeezing profits from operations. He also was devoted to broadcast and had no sentimental attachment to the old Westinghouse. In 1997, Westinghouse would go on to buy the popular cable channels The Nashville Network and Country Music Television, for $1.55 billion, and another large radio network, American Radio Systems, for $2.6 billion. And in January 1998, it would reclaim rights to be a National Football League broadcaster, paying $4 billion for American Conference games over the next eight years. To help pay for the $15 billion spending spree, Westinghouse sold defense electronics for $3 billion, its land development business for $430 million, Knoll office furniture for $560 million, a residential security business for $430 million, Thermo King for $2.56 billion and, assuming it's approved, the power generation business for $1.53 billion. All fetched top dollar. Still on the auction block are its Monroeville-based nuclear energy systems division; its O'Hara-based process control division, which makes software and systems that operate power plants; and its government operations divison, also in Monroeville, which manages Department of Energy sites like the Savannah River facility in South Carolina and serves the nuclear Navy. It wasn't supposed to work out this way. Thermo King and power generation were not supposed to be sold to finance expansion into media. 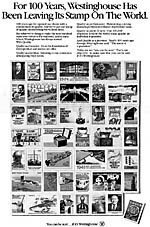 Westinghouse Electric was supposed to survive as a separate industrial company from CBS under a strategy unveiled in November 1996. Westinghouse stock had been languishing despite its media makeover, and its debt still carried junk ratings. By splitting the company in two, the media half could move to New York as CBS, a pure-play stock the markets could understand and value accordingly. The industrial half would remain in Pittsburgh and even retain the WX stock ticker symbol. But there were problems from the start. Fran Harvey, the highest-ranking industrial officer and early front-runner to run Westinghouse after the spinoff, wasn't at the New York press conference where the game plan was unveiled. It was a sign not only that Harvey was out of favor, but also that the separation was going to be difficult to pull off. Analysts said a post-split, industrial Westinghouse would be a $4 to $5 stock, at best, and that it would need all the advantages it could get to generate investor enthusiasm. It was a company largely composed of no-growth businesses in competitive and shrinking markets. This was no time to put an unknown like Harvey at the top; Westinghouse needed a big name. Never mind that many insiders felt Harvey would have been the best man to run the show. Doubts about the proposed spinoff were widespread throughout the organization. When internal polls showed that even senior managers felt the spinoff would never occur, Jordan was aghast. He held an all-day meeting at the Pittsburgh Hilton and Towers in March of 1997 to convince workers of his commitment. But Jordan's word didn't carry a lot of weight with many in the group. When Westinghouse decided to sell Thermo King in the summer, that was the clincher. Even though the move was designed to shift $2.3 billion of pension and other liabilities to CBS, freeing the industrial company of $300 million of annual expenses, it stripped industrial Westinghouse of its only profit-making star. There wasn't much left for investors to latch onto. Finally, the market for power generation equipment deteriorated rapidly. Everyone in the Jordan regime was tired of these quarterly surprises. Over the past three years, there had been promising stretches, only to prove illusory. Siemens, the giant German competitor with whom it had talks two years earlier about a possible joint venture, was contacted. Only this time, Westinghouse wanted to sell. In November, a deal was struck for $1.53 billion. In December, Westinghouse Electric officially became CBS. By the end of the year, Jordan had sold his Oakland condominium for $340,000. The company that only 25 years before had 135 divisions was now down to three: nuclear energy, process control and government operations. It's expected they'll be sold by mid-year. Michael Jordan says he's going to make it a "personal project" to ensure that the buyer of the rest of Westinghouse is committed to keeping the businesses here. Paul Lego believes the local employment situation may improve for workers at the remaining businesses. John Marous notes that many of the divested businesses that fetched good prices -- Knoll furniture, Westinghouse Communities, defense electronics -- were strengthened during his tenure. Douglas Danforth says if you step back, former Westinghouse shareholders are probably better off now as CBS stockholders. Robert Kirby feels as though he wasted his whole career. Donald Burnham worries the Westinghouse name will disappear.